I decided to address the “scary clown phenomenon” on this blog, because there IS a connection to reel librarians. I had another scary movie post all lined up and ready to go this week, analyzing the 1973 cult classic The Wicker Man, but then I got a “creepy clown hoax” email from my workplace. (For real! It was urging us NOT to wear clown costumes this year, for safety reasons). That’s when I decided to address the “scary clown phenomenon” on this blog, because there IS a connection to reel librarians. That connection is the 1990 TV miniseries, Stephen King’s It. Every article I have read about the scary clown phenomenon that is sweeping the country right now mentions Stephen King’s 1986 novel and its title character, Pennywise the Clown. For the record, I have always found clowns scary, and I’m not the only one. Read this Time.com article, “The Surprising History Behind the Scary Clown Phenomenon,” and this more in-depth article from Smithsonian.com, “The History and Psychology of Clowns Being Scary.” Stephen King himself has weighed in on the clown craze and hysteria! I haven’t read King’s original source novel, but I have seen the TV miniseries a few times. I won’t go into an exhaustive analysis of the miniseries right now in this post — there’s not time enough for me to do that — but I will point out that one of the main characters, Mike Hanlon (played by Marlon Taylor as a youth and by Tim Reid as an adult), grows up to be the town librarian. 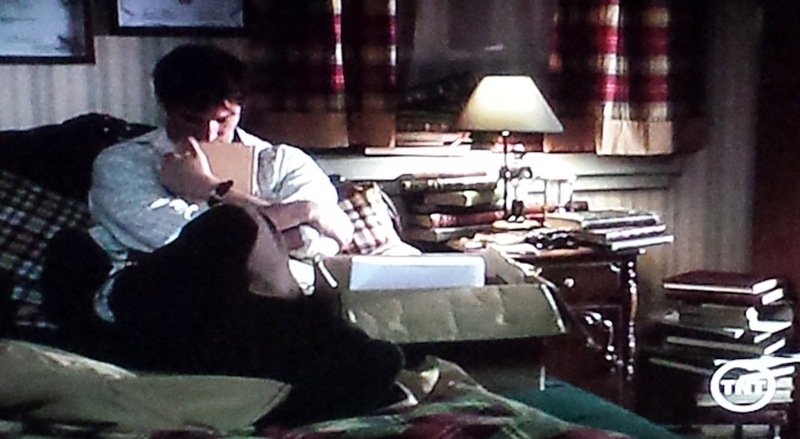 Although other characters get more screen time, Mike essentially serves as the catalyst for the entire second half of the plot, as HE is the one who contacts his friends to return to Derry, Maine, and fight “It” once more. Since Mike is the only one of the seven lead characters to stay behind, he becomes the “institutional memory” for the havoc Pennywise wreaked on the town. Also, being a librarian and archivist, he has resources to help his friend research and confront the evil plaguing their town. “Stephen King’s It 1990. Bill Denbrough and Mike Hanlon” video uploaded by Gunnar Andersson, is licensed under a Standard YouTube license. Next week, I’ll be back with MORE creepy clowns in my film analysis post of The Wicker Man. (There’s a harlequin clown character central to the May Day celebrations.) Stay tuned! Chan, Melissa. “Even Stephen King Has Had Enough of Your Clown Fears.” Time, 4 Oct. 2016. It, aka Stephen King’s It (TV miniseries). Dir. Tommy Lee Wallace. Perf. John Ritter, Harry Anderson, Annette O’Toole, Tim Reid, Tim Curry. Warner Bros., 1990. McRobbie, Linda Rodriguez. “The History and Psychology of Clowns Being Scary.” Smithsonian.com, 31 July 2013. Waxman, Olivia B. “The Surprising History Behind the Scary Clown Phenomenon.” Time, 6 Oct. 2016. Being a librarian equals being a failure in his life. It is only by quitting and embarking on this adventure does he become liberated. 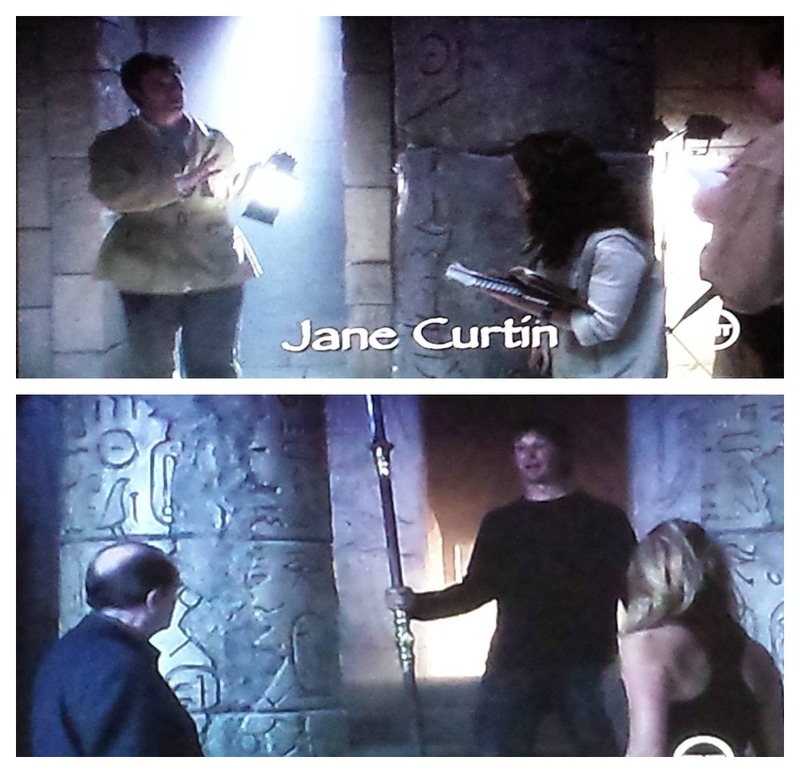 Last week, I delved into how Flynn Carsen from the first ‘The Librarian’ TV movie, The Librarian: Quest for the Spear, fits the Liberated Librarian mold. This week, I take a look at another Liberated Librarian, the title character in the 1990 screwball comedy and cult classic, Joe Versus the Volcano. The basic plot? Joe Banks, played by Tom Hanks, is stuck in a thankless job, and after learning he has only weeks to live, he embarks on an adventure to sacrifice himself in an island volcano. As you do. Hapless Joe steps into a puddle getting out of his car and on his way to a factory-like building, and he raises his arms to heaven as if to send up a plea to save him from his hell. And how does he describe how he feels working in his workplace? As Joe — and the audience — look around, we are met with a depressing visage of a sterile room with blocky desks, screened windows, file cabinets, flickering fluorescent lighting, and half-empty steel bookshelves. Yep, that is the entire advertising library. “Joe vs The Volcano – Joe Quits” video uploaded by RdHolland is licensed under a Standard YouTube License. Angelica: So what did you do before you signed on with Daddy? 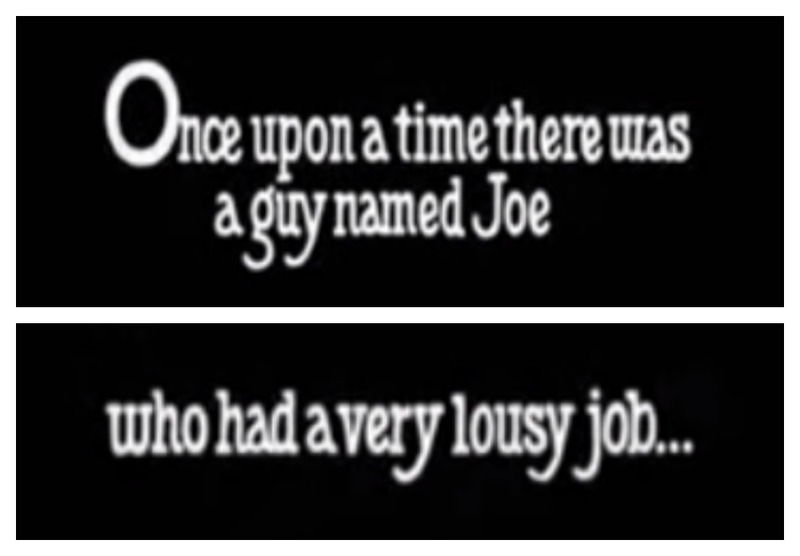 Joe: I was an advertising librarian for a medical supply company. Angelica: Oh. I have no response to that. As he faces the volcano and almost-certain death, he proclaims that “I have wasted my entire life” and “My whole life, I’ve been a victim, I’ve been a dupe, a pawn.” But no longer! In the end, he faces his own fears, alongside Patricia (Meg Ryan again! ), and becomes truly liberated. How Joe Banks differs from, say, Flynn Carsen from ‘The Librarian’ TV movies — who is liberated through actually becoming a librarian — is that Joe is first seen as a failure in part because of being trapped in a “lousy job,” in this case a advertising librarian for a medical supply company. Being a librarian equals being a failure in his life. It is only by quitting and embarking on this adventure does he become liberated. Therefore, Joe Versus the Volcano joins the Class I category, in which the protagonist or other major characters are librarians, and the librarian’s occupation serves as catalyst to the plot. Have you seen the cult classic Joe Versus the Volcano (1990)? Please leave a comment and let me know! Joe Versus the Volcano. Dir. John Patrick Shanley. Perf. Tom Hanks, Meg Ryan, Lloyd Bridges, Robert Stack. Warner Bros., 1990. It doesn’t really matter that Pop and Johnnie work in the prison library — it’s just being used as a shortcut for someplace “safe” within an unstable and often violent environment. 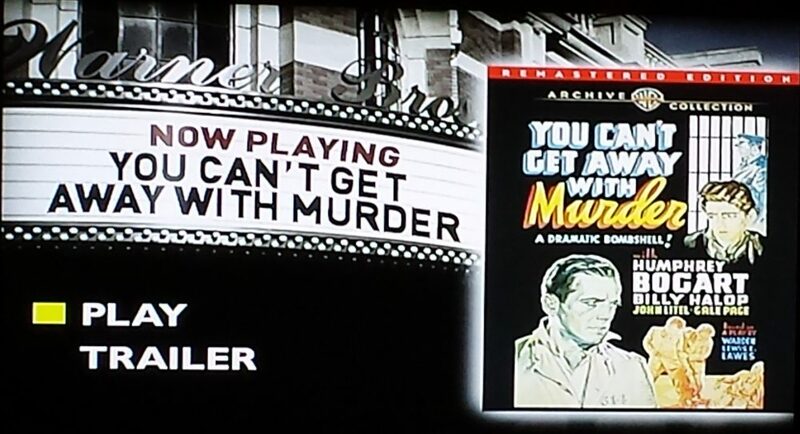 With a title like You Can’t Get Away with Murder (1939), you pretty much know what to expect. Subtle, this movie is not. It doesn’t stand out much from the kind of dime-a-dozen prison and crime dramas Warner Bros. was churning out in the ’30s and ’40s, but there’s also a kind of comfort in that. The film is based on a play co-written by Lewis E. Lawes, who was prison warden of Sing Sing Correctional Facility at the time. 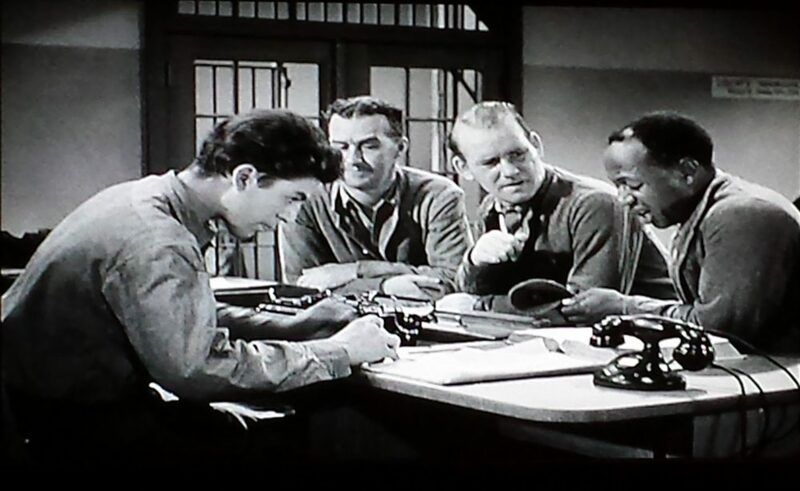 Lawes actually wrote a few books and plays about the prison experience (as he saw it); his most famous, and most popular, work was Twenty Thousand Years in Sing Sing, which was made into a movie in 1932 starring Spencer Tracy, and remade as Castle on the Hudson in 1940. (By the way, Lawes wrote these while he was still warden of Sing Sing — no worries about conflict of interest, huh???) The play this film is based on, “Chalked Out,” was apparently a huge flop when it premiered in 1937, closing after only 12 performances! Humphrey Bogart gets top billing, but he isn’t really the main character; in fact, Bogart had played this kind of character so often by this point, that his performance and role as baddie and minor crime boss Frank Wilson are practically paint-by-numbers. But Bogart’s facial expressions are always compelling, as seen below. The real lead is Billy Halop, who plays Johnnie Stone, a young man who gets in over his head by helping Frank on a couple of jobs — and gets thrown in prison along with Frank for his efforts. 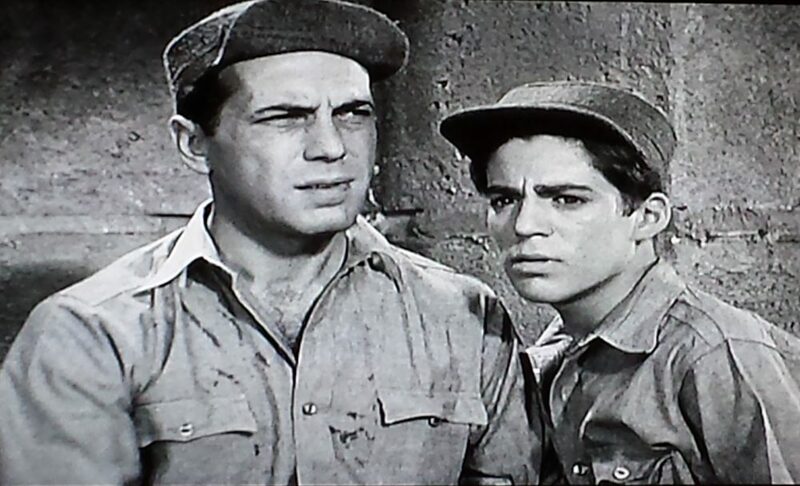 Halop was well-known by 1939 as one of the leaders of the “Dead End Kids,” characters in a series of plays and films that featured young actors as tough street kids. Even though Halop, like Bogart, had also played this kind of character many times by this point, his acting… I’ll be nice and just say he’s not as compelling as Bogart. It’s almost like Halop is acting as if he were on stage, using overly broad gestures, facial expressions, and shouting a lot, while everyone else is acting in a movie. Poor Johnnie, he’s just not cut out for prison. He’s scared of Frank — Bogart always played menacing really well, even in a mediocre film like this one — and he’s holding in a dark secret that’s giving him the shakes. No spoilers here, I promise. 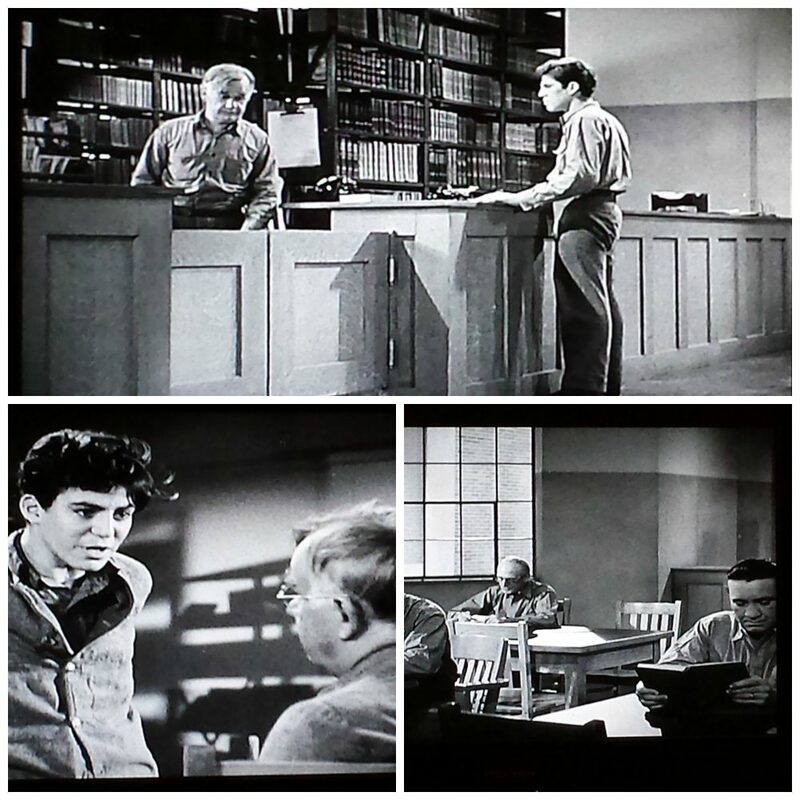 Eventually, almost 30 minutes in the film, Johnnie gets transferred from the shoe-making shop to… you guessed it, the library! And guess who’s NOT happy about it? Guard: Pop, this is your new assistant, Johnnie Stone. This is Pop, your new boss. Pop: How much time has he got? Guard: You’re doing 5 to 10, ain’t you, Johnnie? Pop: Five? That means in 3 years and 4 months, the parole board will yank him out. It takes me 2 years to break a man in on this job. I told the warden nothing less than 10 years, lifers preferred. [Turns to Johnnie] Know anything about books? Pop: I thought I was getting an assistant. Guard: Johnnie’s all right, as long as he keeps away from this big-shot pals. This ought to keep him busy. All in the line of duty, Pop. Where this film also sets itself apart a bit from other, run-of-the-mill prison dramas is in the strength of its supporting cast. If you’re a fan of old movies like I am, then you will recognize a lot of these character actors. 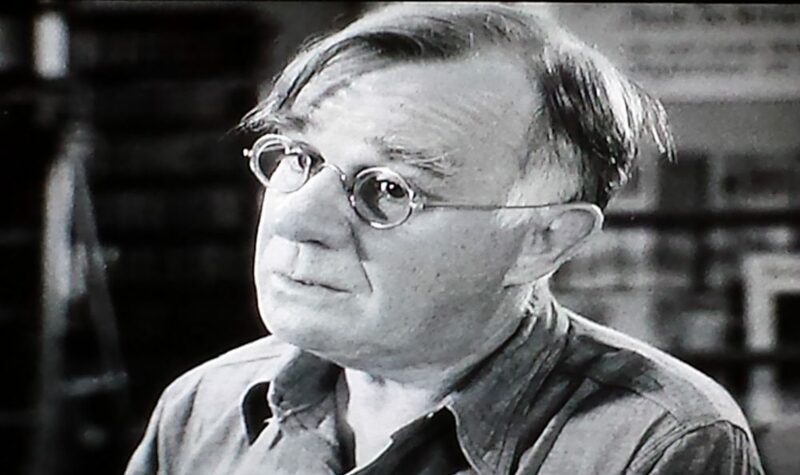 Henry Travers is one of those character actors — if he looks familiar, that’s because he played Clarence, the angel who helps Jimmy Stewart out in It’s a Wonderful Life (1946). 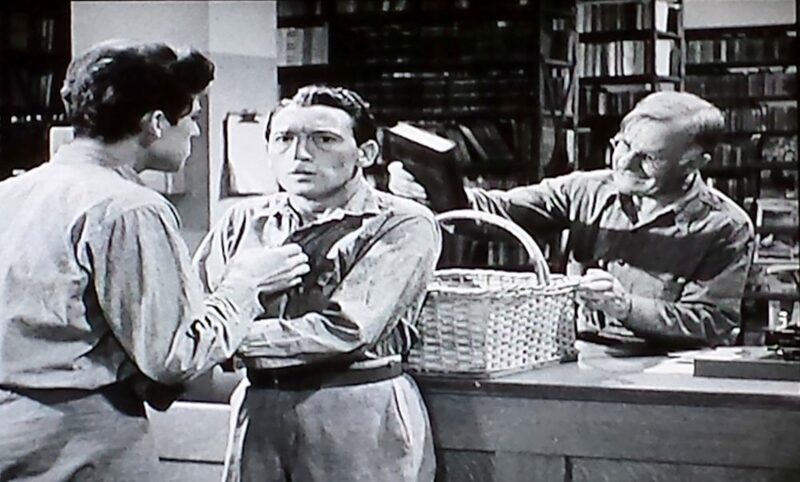 In fact, in that classic film, Travers was the one who revealed that Mary turned into a spinster librarian! And in this film, he gets to play the male version of a spinster librarian, a self-confessed “old timer” who has found his life’s meaning in the prison library. He takes pride in his library — “I’m the boss of this library!” — and won’t stand for any shenanigans in his domain. He breaks up several heated arguments that take place in the library. In one scene, a weasel-y prisoner is trying to get something out of Johnnie, so Pop comes to the rescue by hitting him over the head with a book! Take your books and get out, or I’ll knock the bottom right out of your filthy little racket. Pop has earned respect from both his fellow prisoners as well as the prison guards. Pop also has a heart condition, and several times, different people express concern about his failing health. 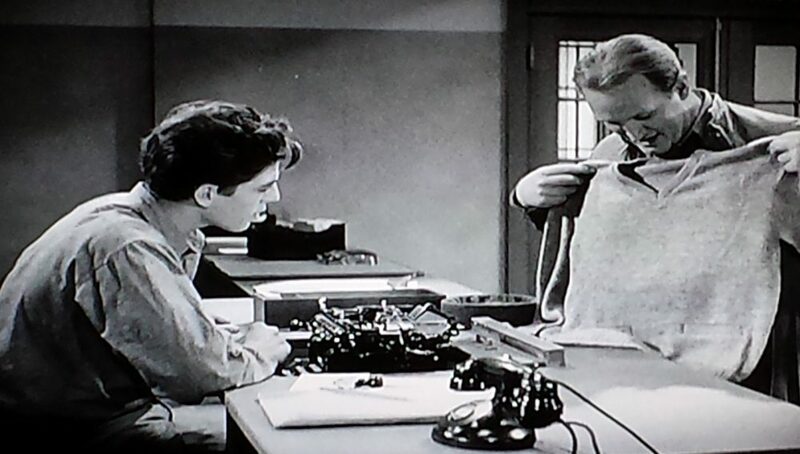 One prisoner even knits Pop a sweater! I figured the old man could use it, what with the cold weather setting in. You know he’s been kinda slipping lately, Johnnie. He’s a great guy, kid. 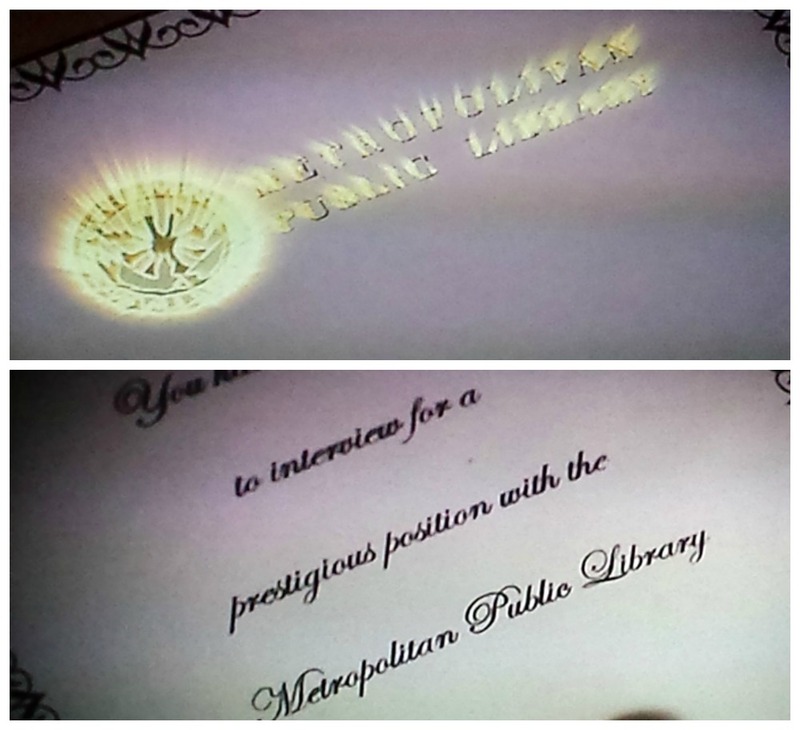 Gee, Johnny, you get to know more about the library than Pop does. Johnnie has grown up a bit under the protection and tutelage of Pop, but with added pressure (and let’s face it, because reasons of PLOT), he soon cracks again. 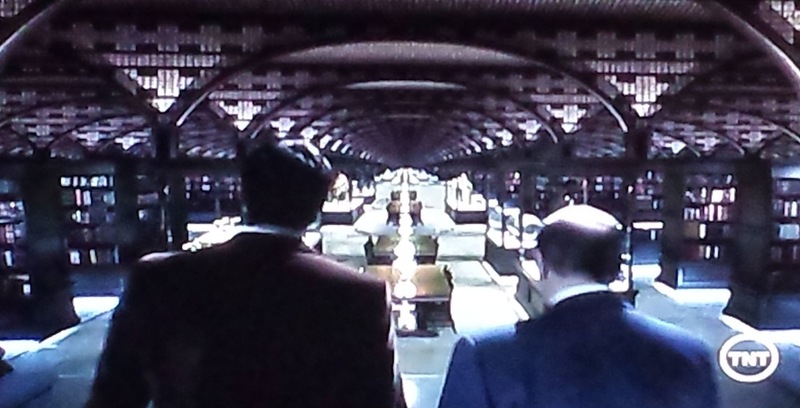 Almost an hour into the film, in a pivotal scene between Pop, Johnnie, and Frank that takes place in the library, Pop gets to deliver a big emotional speech, trying to convince Johnnie to go straight. I won’t spoil anything here, but I will say that Johnnie does find his own kind of peace in the end of the film. In this way, Johnnie fulfills the Liberated Librarian character type. Initially seen as a failure, the male Liberated Librarian eventually breaks free (even in a metaphorical sense); this type usually needs outside force or action to instigate “liberation,” as is the case here. Liberated Librarians are also usually central characters, and in this film it’s Johnnie’s story, and personal arc, that fuel the entire plot. Pop fulfills both the Information Provider role, as well as a version of the Librarian as Failure character type. I maintain there is a special subset of the Male Librarian as a Failure character type carved out for prison librarians — the “failure” in this sense is often a social construct, like a prison. Prison librarians, who fit into this category as societal “failures,” often get their positions because of good behavior while in prison. It’s an interesting contrast, a “failure” on the outside of those prison walls — but a “success” on the inside. There’s also a telling moment about Pop’s real name that ties in with this character type. Guard: He’s forgotten his real name. Pop: Pop will do. I’ll never need another name. 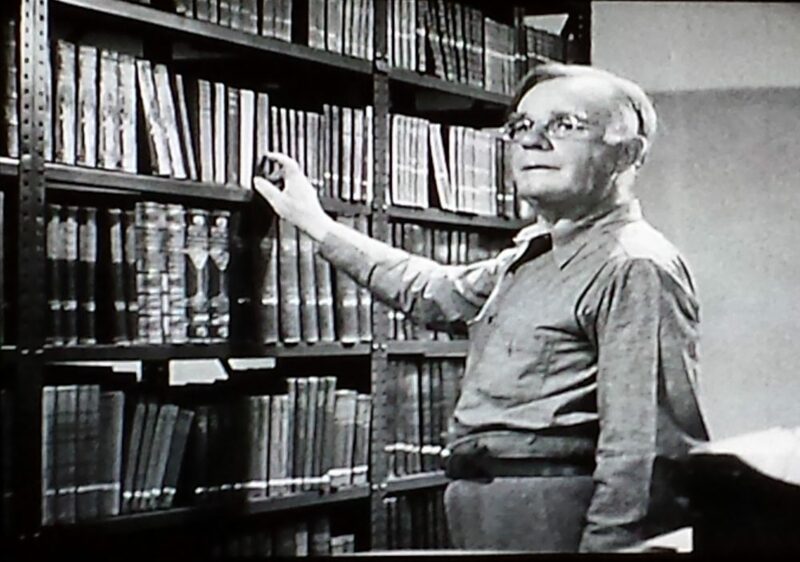 Overall, You Can’t Get Away with Murder (1939) lands in the Class II category, films in which the protagonist or other major characters are librarians, but the librarian’s occupation does not directly affect the plot. It doesn’t really matter that Pop and Johnnie work in the prison library — it’s just being used as a shortcut for someplace “safe” within an unstable and often violent environment. And a librarian character onscreen brings immediate trust, and we, along with Johnnie, need someone to trust in this movie full of untrustworthy characters. 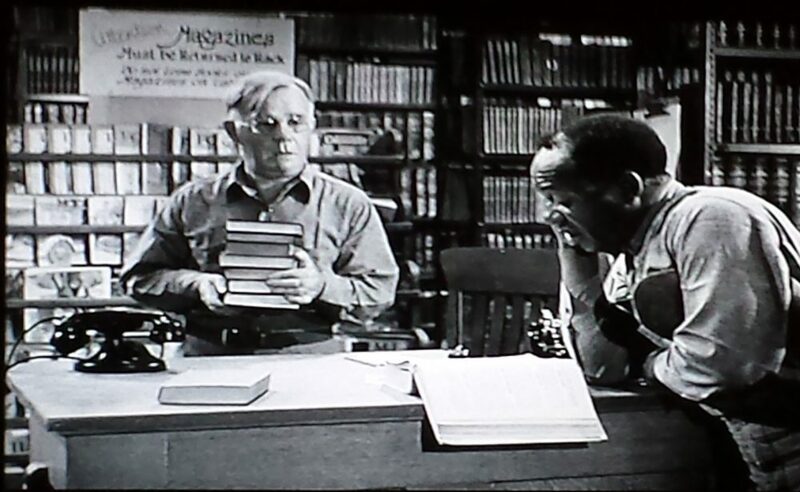 It would have been a Class III film, if we had seen only Pop in the library, but because Johnnie gets to be the library assistant, he upgrades the film to Class II. And what of the prison library itself? It’s a quite spacious set, with several tables and chairs. There are also quite a few tall metal bookcases, which create some interesting shadow effects and lighting. A long counter separates the “closed stacks” of the library and the open seating area. The main set-up seems to be that runners from different areas of the prison go to the library to drop off books and pick up new titles (as opposed to Pop taking books out of the library to different parts of the prison). And last but not least, a moment that made me laugh. 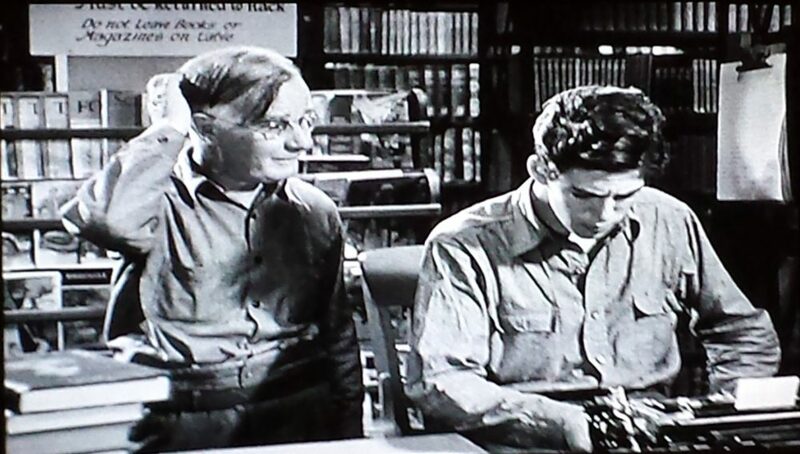 When Pop starts training Johnnie, he starts off with a task to “get acquainted,” a task to “study this catalog.” He hands him a thin sheaf of papers — the prison library’s card catalog! A low-tech library catalog list! “Dead End Kids” via Wikipedia is licensed under CC BY SA 3.0. “Lewis E. Lawes” via Wikipedia is licensed under CC BY SA 3.0. You Can’t Get Away with Murder. Dir. Lewis Seiler. Perf. 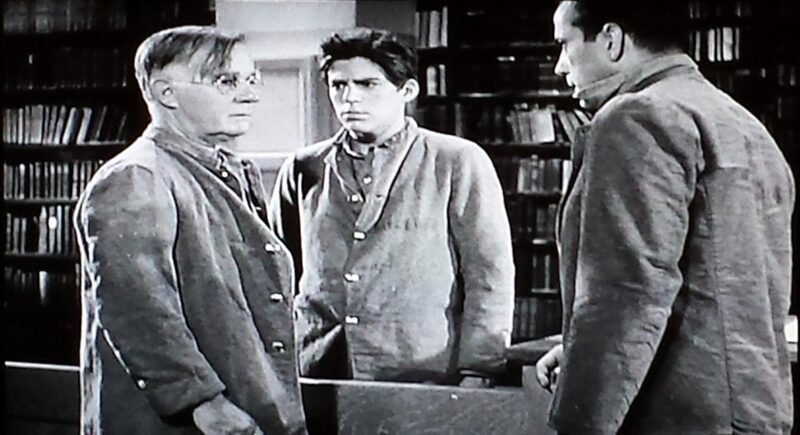 Humphrey Bogart, Billy Halop, Gale Page, Henry Travers. Warner Bros., 1939.